Abbie's parents are Bob and Tara Johnson; sister is Helen Johnson; Grandparents are Loran & Corleen Mathews and Bill & Karin Johnson. Miss Finland is Kaisa Johnson, a senior at Astoria High School. Kaisa’s Scandinavian heritage comes from her mother who is 100% Finn. Kaisa was Junior Miss Finland in 2005 and was a Viking/Nordic dancer for nine years. 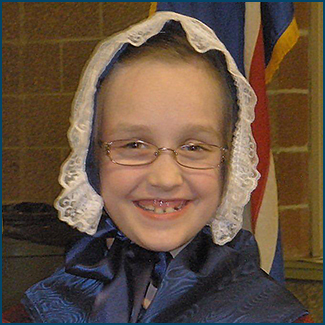 Her favorite foods at the festival are lefse and krumkake. Kaisa looks forward to participating in the Troll Run at the festival on Saturday morning, June 20. Kaisa thinks the festival is important because it’s helped her to learn about her ancestors and their culture and to keep their traditions alive. After graduation, Kaisa plans to attend the University of Oregon and major in English to become a school teacher. 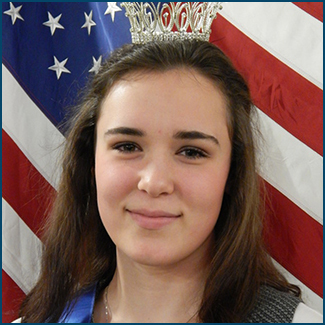 Miss Norway is Leah Marie Telen, a senior at Astoria High School. Leah’s great-grandmother was 100% Norwegian. Leah enjoys watching the dancing at the festival, especially when her little sister dances with the Viking/Nordic Dancers. Sampling Scandinavian foods at the festival is also a favorite activity, especially the Swedish meatballs. This year Leah had the opportunity to visit the Sons of Norway Lodge in Gearhart to learn how to make lefse. Next year Leah plans to study Nursing at Clatsop Community College. Miss Sweden is Kristina Kjellberg, an exchange student at Astoria High School. Her family lives in Uppsala, Sweden. Kristina looks forward to attending her first festival this year to see how Scandinavian Americans celebrate Midsummer. She looks forward to trying all the Scandinavian delicacies offered for sale because she misses the food from home. 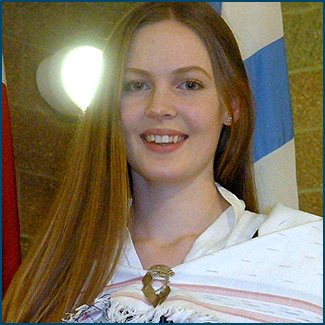 To prepare for being on the Scandinavian Midsummer Court, Kristina talked to her parents about her family history and has learned interesting things about her ancestors that she didn’t know before. Kristina will return home to Sweden soon and has two more years of school to complete before graduation. 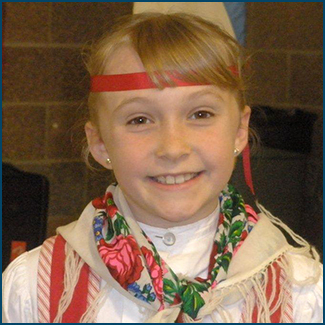 Junior Miss Iceland is Delaney, a student at Lewis and Clark Elementary School. 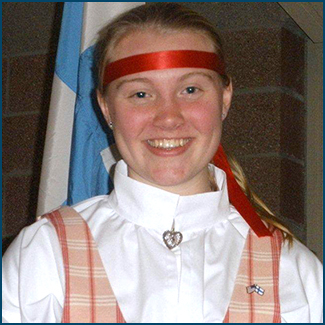 Delaney dances with the Nordic dancers and will perform with the group at the festival this year. 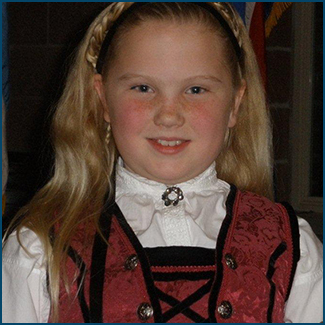 Junior Miss Sweden is Payton, who attends John Jacob Astor Elementary School. Payton’s maternal great grandmother was 100% Swedish. Payton looks forward to the bonfire on Friday night because she and her grandmother Billie make hexes to throw in the fire. Payton and her mom are members of the Vasa Lodge #215 and in 2016 her family is taking a two week trip to Sweden to meet Swedish relatives. 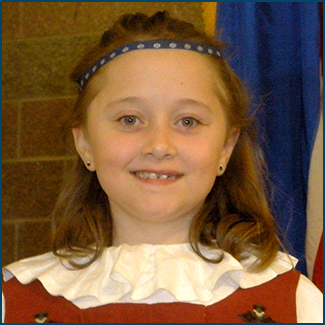 Junior Miss Finland is Avery, who attends Lewis and Clark Elementary School. Her great-grandmother was 100% Finnish. 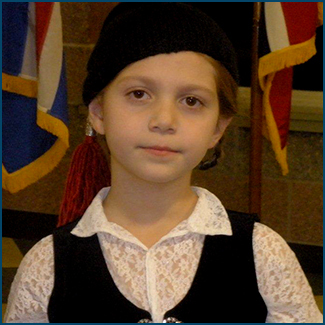 Avery has attended many festivals and always enjoys sampling the prune tarts. She’s even eaten lutefisk at the Finnish lodge. Junior Miss Denmark is Sophie Rose, who attends Warrenton Grade School. Her family has been involved in the Lower Columbia Danish Society for many years. Her mother was previously both a Junior and Senior Miss Denmark. Sophie looks forward to the festival every year so she can eat aebleskivers, Danish pastries offered for sale by the Lower Columbia Danish Society. Junior Miss Norway is Raelee Anne. 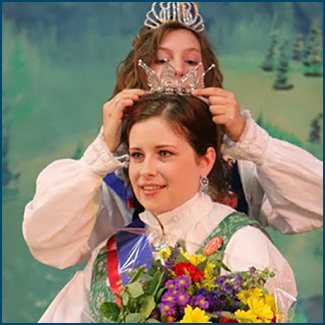 She is a student at Lewis and Clark Elementary and her sister, Leah, is Miss Norway. Her Norwegian heritage comes through her great grandmother who was 100% Norwegian. 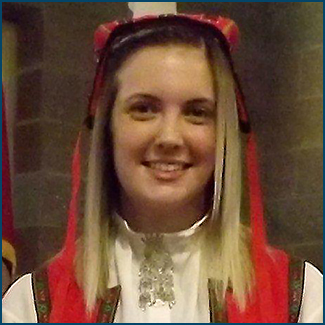 Raelee dances with the Nordic dance group and attended her first festival last year. Being on the court has been fun for Leah because she’s learned more about the Norwegian side of her family. Crown Bearer is Stian who attends Lewis and Clark School. Stian’s grandmother on his mother’s side was born and raised in Finland. Stian enjoys sauna at home and eating lutefisk during the Christmas holiday season. He’s attended every festival since he was born and his brothers have also been crown bearers. His favorite beverage at the festival is the lingonberry juice. 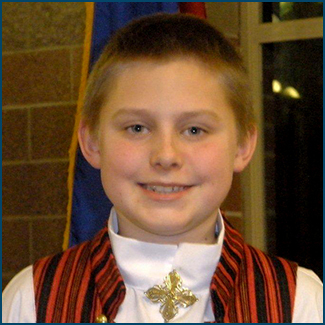 Stian has attended the Norwegian Camp at the Sons of Norway to learn a Scandinavian language and his family hopes to travel to Scandinavia soon.